I want to tell you a little story about a former student of mine. I know this bears no resemblance to your life at home or your student, but it is one scenario. Johnny (name removed to protect the innocent) comes home every day after school and plops himself in front of the television. The first thing he does after making a quick snack is grab his game controller and put on his headphones, log into whatever game he is playing right now and start destroying enemies and overcoming various challenges while chatting through the mic with his friends. His game play goes on for hours until mom and dad return home from a hard day at work and ask him: "Do you have any homework?" Johnny replies "No" and returns to his game until supper is ready. A couple of weeks later, progress reports come home and parent-teacher conference night occurs. Suddenly, mom and dad are wondering why Johnny has low grades when he hasn't had any homework all quarter long! They are both confused and surprised. When they meet with Johnny's teacher, they learn that he never turned in several assignments and performed poorly on both quizzes and tests alike. The teacher recommends that Johnny attend tutoring for help and studies the class materials at home. Does any of this story sound familiar to you? Would you like to be more involved with your student's learning but aren't sure how to overcome that silence that teens often exhibit around parents? Or, perhaps you just want to know what your student is learning in a digital arts class. This is where Schoology comes in! Schoology is an online learning management system. Learning management systems (LMS) are software applications used for the administration, documentation, tracking, reporting and delivery of educational courses or training programs. 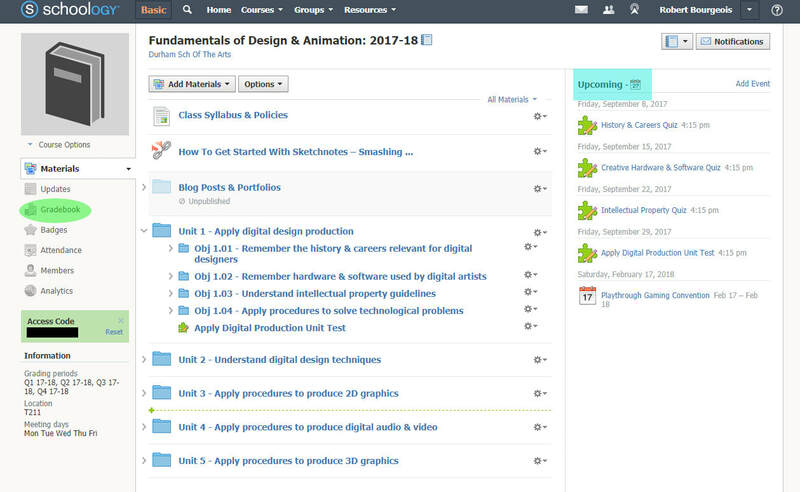 While there are many different LMS options available (I have explored Blackboard, Moodle, and Edmodo), I have been using Schoology with my classes for the past couple of years and and really like it. As mentioned in my Classroom Policies page, my classes are fully digital and your students will live online for everything we do. This means that anywhere you and your student have access to the Internet, you can access my class materials. There is even a free app that one can be installed on their phone or tablet for Schoology! So, what does joining Schoology provide for you, as a parent? So, how do you get access to this amazing resource? First of all, once I get the student accounts all set up during the first week of school, I send all parents a unique access code for their student based on the information provided to me during open house. If you were not able to attend open house, all you have to do is send me an email with your student's name and class period so I can send you the access code for your student. Next, you need to create a Schoology account, using that access code. Email format should include my in the address firstname-lastname@my.dpsnc.net. Failure to include this will result in an inabillity to receive emails including information in the event that you forget your password. Make sure your password is something YOU WILL REMEMBER. I don not have access to your account information, so it is important you will not forget your password. Enter your birthday. 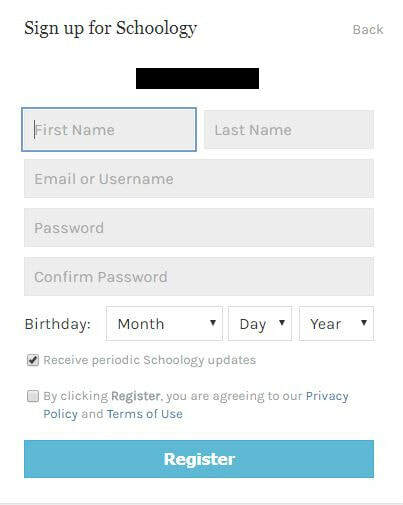 It is important that you use your ACTUAL birthday as entering anything else may cause problems for you to access the class materials. Check the box at the bottom to AGREE to the usage terms. In the upper right side at the top, you will notice Sign Up. Select PARENT from the options. Enter the ACCESS CODE provided to you. Fill in the form on the next page correctly. Use whatever email address works best for you. If you have set up a Schoology account in previous classes, you should already have access to your student's new class with me. If not, please email me and I will send the access code again. When you first log into Schoology, you will land on the Home page, seen above. To access your student's course, select the appropriate course title using the Courses menu at the top (see yellow circle). Other important items on this page include the Upcoming (green circle) events list. This lists the next 10 or so items that are coming up for your student including events, assignments, quizzes, tests, etc. Also of importance is the Calendar (blue rectangles). This provides an overview of the class as a whole with all items listed in a monthly calendar format. Please remember that until I enable an item, it will not appear on the calendar or in the upcoming events. Unless there is a special reason for showing an item, I do not enable work until it is assigned to the class but quizzes and tests will always appear well ahead of the scheduled date in both locations. Once you access your student's class, seen below, you have access to all the materials we use at school. Note that your screen will differ slightly from mine but the overall appearance is similar enough to use the image below for this instruction. Like I mentioned above, your access to my class is read-only, but it does provide a good detailed look at what your student is learning in my classroom. You will notice the Upcoming (blue rectangle) events list again on the right side of the screen. It serves the same purpose as the Upcoming events list on the home screen. You should also have access to a gradebook (green circle) on the left. This gradebook does not provide your student's overall grade but does allow you to see individual assignments/quiz/test grades and access the rubrics/assignments with a quick click. To see your student's overall grade in my class, please refer to PowerSchool. Also note that I do not utilize attendance in Schoology, which should be accessible in PowerSchool as well. In terms of class materials and resources, everything can be found organized in folders by objective, where appropriate. I hope this information helps you see the value in using Schoology. At this point, you should be reasonably comfortable with the interface as well. Whenever I have a parent conference about a student, this is the first resource that I point parents to so they can gain a better understanding of how their student received the grade they are getting in my classroom and my expectations for my students.